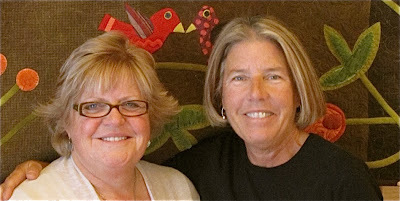 I have 4 wonderful gals that work with me Cathy, Peggy, Mary and my eldest daughter Kelly. With my busy schedule they all keep me very organized as well as run the online store and our ever popular BOM. Kelly has started a new blog Sue Spargo;Twee (which means two in Afrikaans) She posts with a younger eye all the new happenings here at Sue Spargo Folk-art Quilts online store. I invite you to visit become a follower and keep up to date with all our new happenings. The new 2012 BOM which will be available for sign ups on October 1. 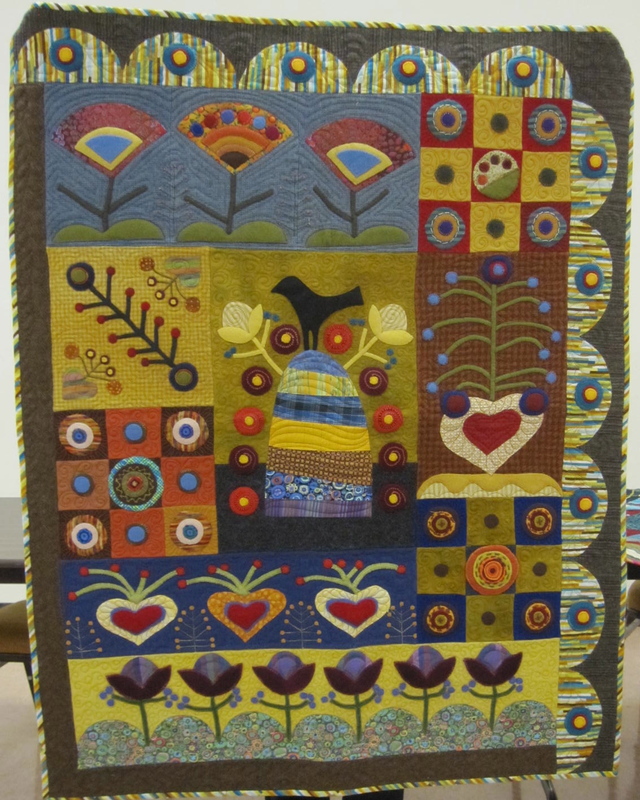 I just spent a few days with the wonderful gals at the Tucson Quilt Guild. I was treated to dinners at wonderful restaurants and was able to see a little of this great city. 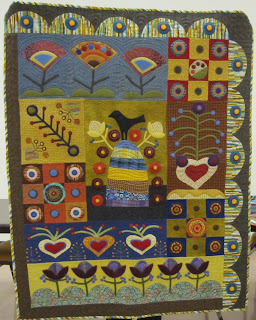 I always love to see finished projects from past classes, Roselee brought her lovely Flowerpot Quilt to share with me. 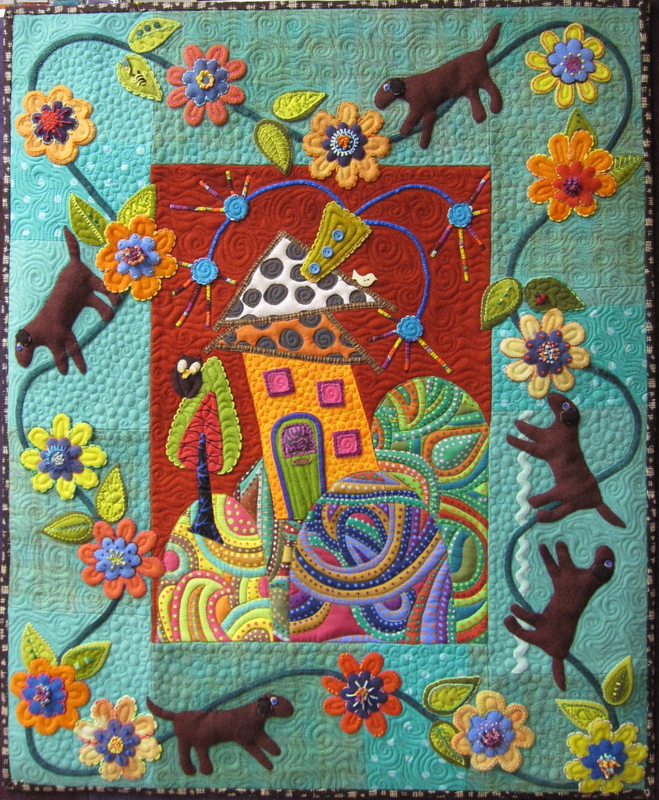 She took a class with me in Grand Junction, CO.
Don’t you love this fun Folklore Quilt? 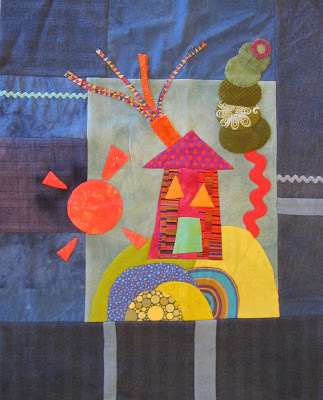 We worked on my Greta Needle Roll one day and each student designed their front cover using wools, cottons, velvets and roving balls which we made in class. 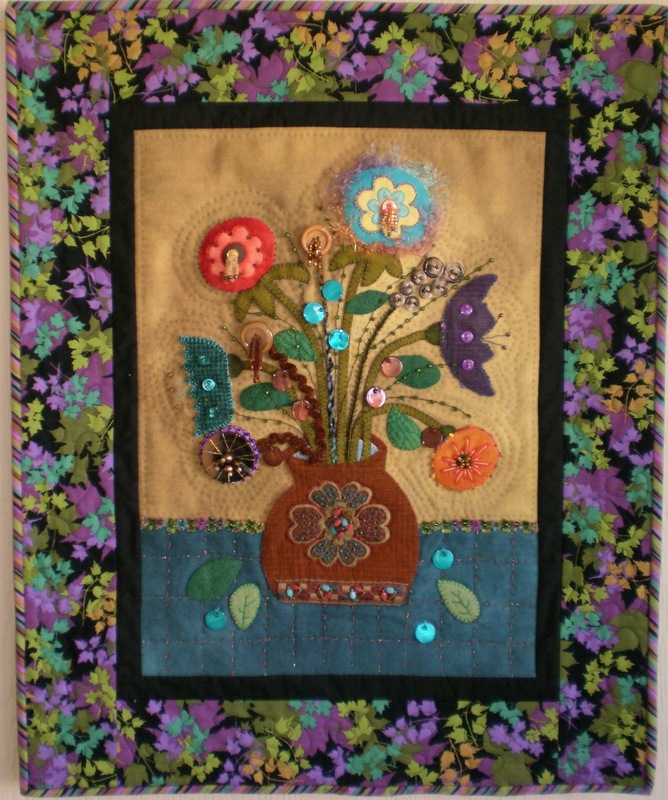 The second day was the Flowerpot class where we worked with wonderful ribbons, beads and layering of the flowers and leaves. Manya shared her version of my Ginger Grove quilt. I love her striped scalloped border. I had a wonderful time and thanks everyone for taking such good care of me. 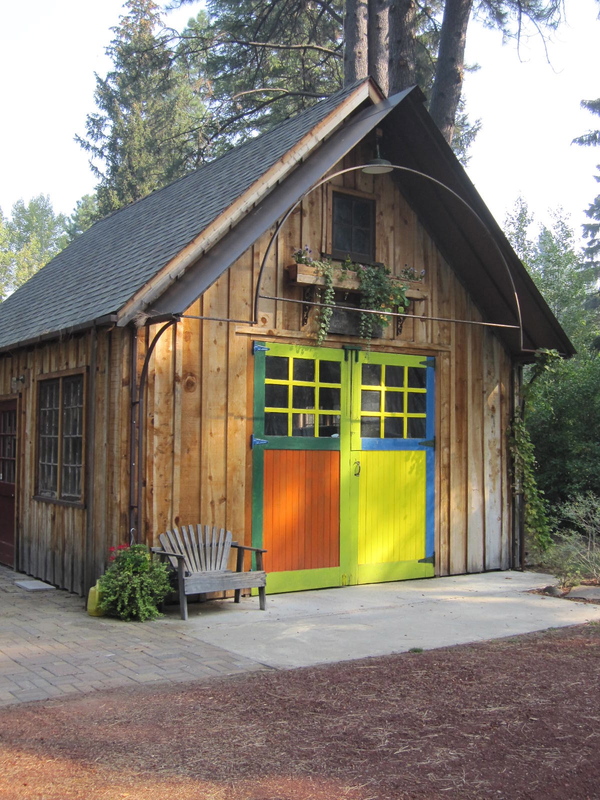 I have just spent a wonderful weekend co-teaching with my friend Tonye Belinda Phillips in Camp Sherman Oregon. 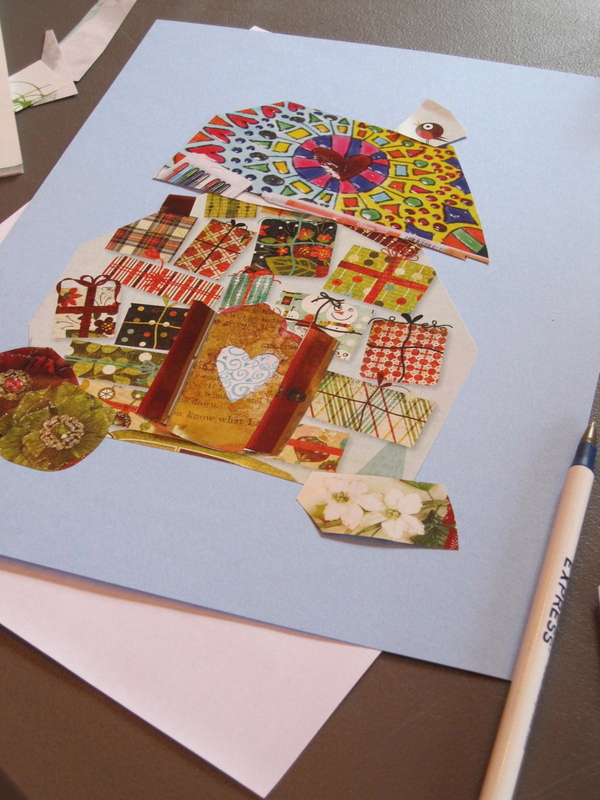 The retreat was sponsored by the Stitchin’ Post in Sisters OR. 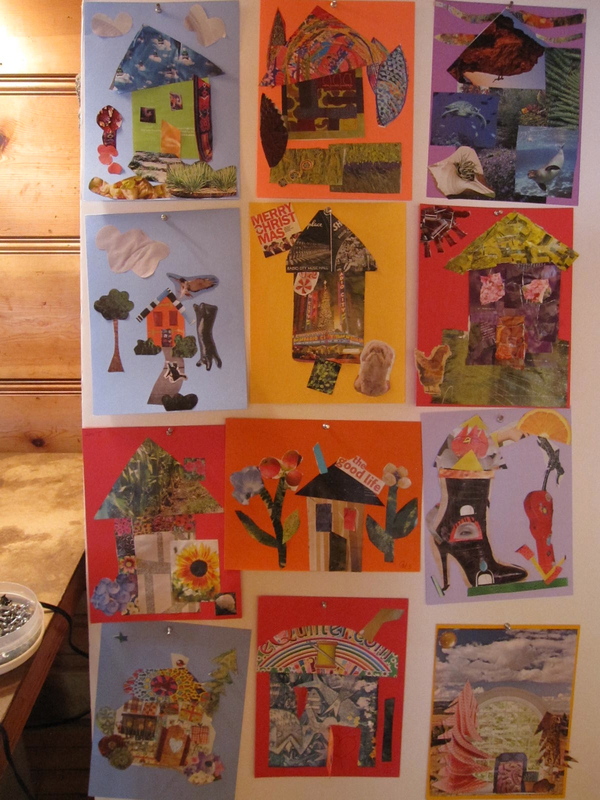 We had 40 very creative students who worked on wonderful pieces using ideas from our collaborative quilt. 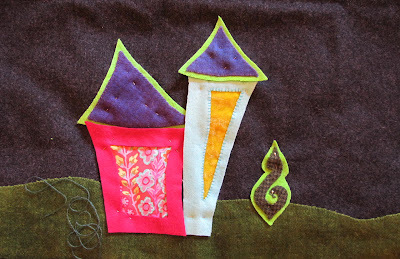 Late last year Tonye sent me a couple of house blocks she created and the idea was I would continue by adding borders and do a little embellishment. I really got into the embellishing needless to say I only finished the one so I still have a little homework to do so we each can have a finished quilt. This is Tonye and Doug’s home in Camp Sherman. 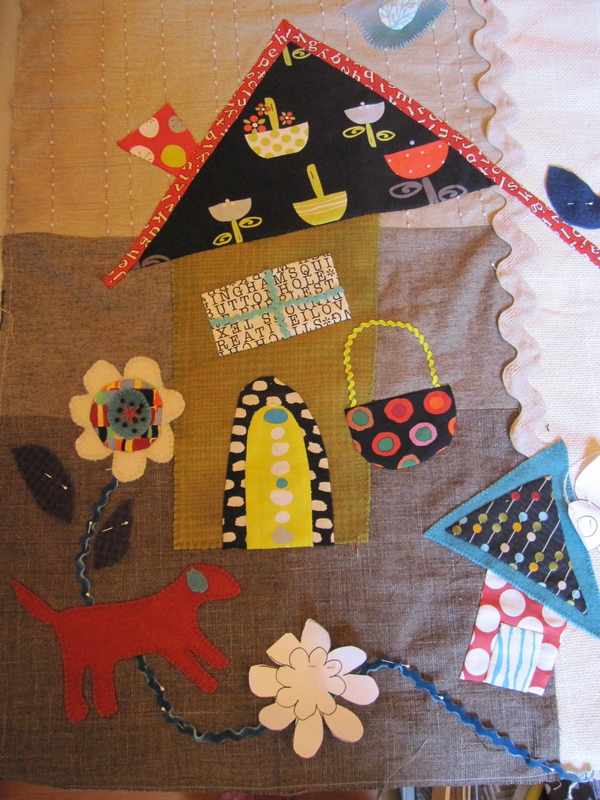 You can see where she gets her inspiration from for her wonderful house quilts. I was lucky to be invited to stay in their little cabin. It was so peaceful! Just down the road was the community hall where the retreat was held. Tonye and I spent the whole day before hanging quilts and making the room really cozy. If I say myself it looked fabulous. Tonye had this great 15 minute warm up exercise that all the students did cutting out of magazines and creating funky houses. Now that they were warmed up we got to work creating for three days. 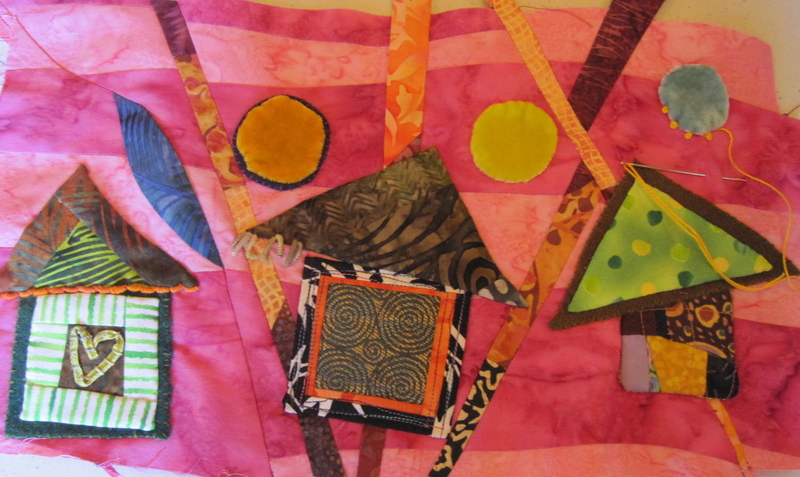 We talked about color, using pattern, cotton appliqué, wool appliqué and embellishment. During the weekend we had three surprise guests visit. Jean Wells explained how to make a quick snap bag, Kathy Deggendorfer a watercolor artist did a slide presentation explaining the collaborative art pieces her and Tonye do together. Jackie Erickson made small pincushions using roving balls. I flew to Tucson on Monday to teach for the Tucson Quilt Guild. I am looking forward to my time here in AZ. I have just returned from spending a week with my family in Spokane. It was great as Jason was visiting as well as he is waiting to start Culinary School in Portland. 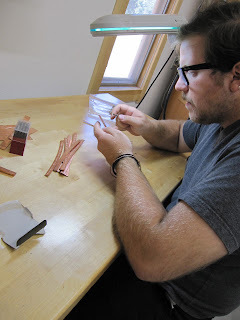 While visiting he managed to make us another few sets of hand stamped words for the website. I took a few pictures to show each stage he goes through to achieve the words we all love. He cuts the strips of copper, hand stamps each letter and drills and files the holes for attachment. He then patinas them, buffers them, hand cuts the strips into individual words then hand files each piece so they are nice and smooth. Quiet a lot of work for one word! They are unique and I feel anything handmade is worth the wait. I am hoping he can make us a little stash before he returns to school as I know we will not see anymore for a long time. Jason treated us to home made pizza as well. He loves to cook and experiment! Wendy has been very busy in her studio dyeing new colors for next years Block of the Month. I am really excited as once again it will be very different. Here is a sneak peek of the start of the color palette. 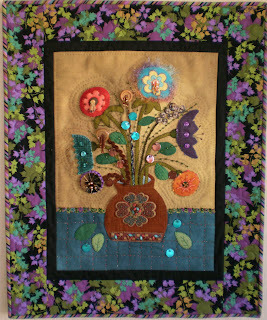 I have been longing to sew with my sister Wendy. 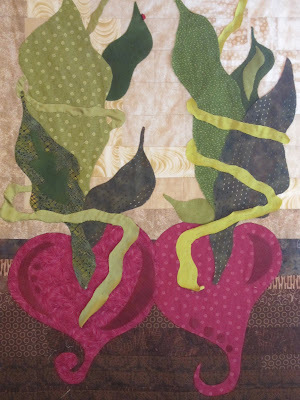 For a long time she has been saving the off cuts and double dye scraps from her dye pots. On Wednesday we snuck into her studio, dumped out all the wool and spent the whole day cutting and sewing all the pieces back together. She had just ordered a new Juki sewing machine which we set up. What an amazing machine, I could not believe how wonderfully it sewed on wool. I will be ordering myself one as soon as I am home for a few days. All I can say is I know I will be playing around with this idea a little more. My family lives in a more rural area of Spokane. I love the view they have overlooking the valley. 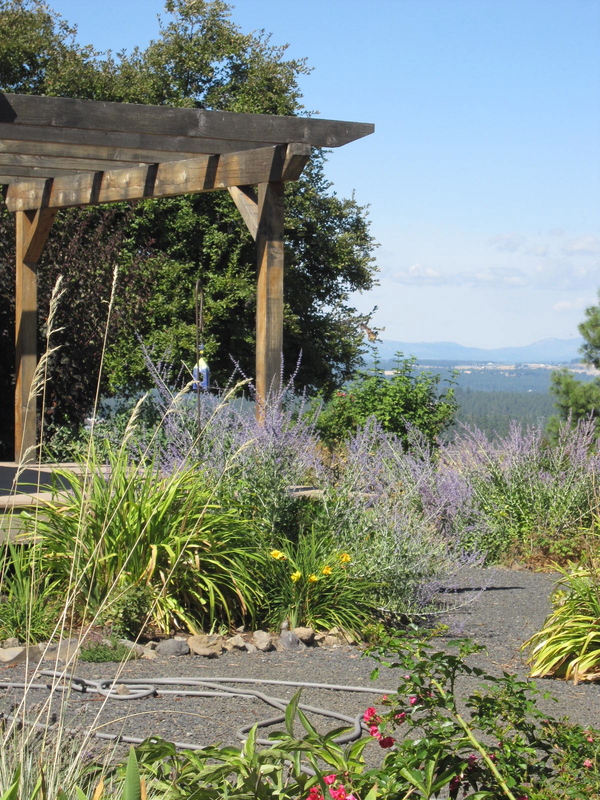 They have an amazing vegetable garden as well as perennial gardens which surround the house. It is so peaceful here. I always feel very refreshed when I return home. I am now home for a couple of days preparing for Sisters. I am co teaching a Folk-art Retreat this weekend with Tonye Phillips. I am really excited as our styles are very different but complement each other. I know the students will be in for a treat.